I am not exactly a fan of Japanese pop music. Most of it isn’t great, especially the idol stuff. If I listen to Japanese music it’ll be most likely eX-Girl or the Pillows. But a couple of years ago on a Sunday morning, I got sick of “Insiders” and started flicking around until I came across SBS’ “Pop Asia” program. Though the show had a very heavy emphasis on Korean pop, there were a few Japanese music videos. On came Perfume’s “Spring of Life” video. While it certainly wasn’t an instant love affair with the group, I saw enough of the trio’s fun and inventive video clips over the next few months to become a little bit obsessed with them. I eventually bought all of their albums and most of their singles on my last trip to Japan. Why on earth would I love this little group consisting of three young women; Ayano Omoto (nicknamed “Nocchi”), Yuka Kashino (“Kashiyuka”) and Ayaka Nishiwaki (“A-chan”)? I suppose the key thing which got me was their music, written, performed and produced by Yasutaka Nakata of the Japanese dance music duo Capsule and also the writer and producer of Kyary Pamyu Pamyu’s records. Unlike the majority of idol music, Perfume is far more like dance music, albeit with a pop sheen. It really sounds nothing like other J-Pop I’ve heard. The complexity and intricacy of songs such “Spice” really impressed me and tracks like “Edge” weren't usually something you'd associate with a pop group. The positive outlook of most of the lyrics got me as well (for example from their highest selling single “Love the World”; “Have a nice day/Be in a good mood yeh/In all the world/Love the World”). I was also intrigued by their sophisticated and mature image, which isn’t really seen in idol groups. They are marketed at far more general audience rather than the bog standard male idol otaku; they wear modified designer dresses as their stage outfits, put on increasingly elaborate live shows involving projected computer graphics and don’t do photobooks filled with bikini shots unlike their peers. 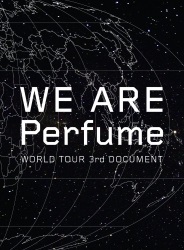 This documentary film revolves around Perfume’s third world tour in October and November 2014 taking in Taipei, Singapore, Los Angeles, London and New York. This tour is special as it’s the first time they will perform in the United States. However the film begins four months after the tour where the group put on a stunning and technically complex performance at the South by Southwest (SXSW) festival in Austin Texas which wows the media, which is pretty hard considering the hundreds of bands who jostle for attention on the 24 hour a day schedule during the duration of the festival. The documentary curiously downplays what they have just achieved. We then rewind back to rehearsals for the tour in October 2014. There they discuss the set list and costume changes with Mikiko, their dance choreographer and artistic guide. She has worked with group since 2005 and since than taken on a much larger role within the group of advising what artistic directions Perfume should take. Before they start their world tour in Taipei, the documentary takes an all too brief look (less than 30 seconds really) at the beginnings of the group in Hiroshima in 2000. It’s the biggest misstep of the documentary. The film is meant to show the world that Perfume have made it to the world stage but oddly omits their massive struggle to even become popular within their home country. Unusually they formed at Actors School Hiroshima as 9 year olds, released a local single a few years later in 2002 and then had the good fortune to get the young and upcoming Yasutaka Nakata as their producer from their second single in 2003 which certainly made them stand out sonically. They moved to Tokyo soon after and struggled to get any attention or sales of their records, even resorting to handing out flyers on the streets of Akihabara themselves. Somehow they got the attention of major Japanese label Tokuma Communications who signed them in 2005. After three mediocre selling singles for the label, they were ready to drop them. However they decided to give them one more shot with the single “Polyrhythm”. It became the theme song of a recycling campaign by government broadcaster NHK and due to the exposure became a top ten hit. Every subsequent single for the group went top five on the charts and all five of their studio albums have gone to number one on the charts. They have sold more than three million singles and albums in Japan. Not only that, they have gained a large following outside Asia purely by word of mouth and with no promotion by their management or label or with their music being available outside of Asia. Sure Kyary Pamyu Pamyu and Babymetal may be (almost) household names in the west unlike Perfume, but both those artists had backing by major western labels. Perfume did not and continues to have little to no promotion form their current record label, Universal, in the west. And you could suggest that both Pamyu and Babymetal are novelty acts, which Perfume definitely isn’t. The documentary follows the group from Taipei to Singapore. But this section flies past very quickly and is all over by the 40th minute mark of the film. The most interesting thing about this section of the film is the mature aged Australian couple A-chan singles out at the group’s Singapore show. While a lot of the early material sort of makes the documentary seem like a glorified home video (mostly on small HD cameras), it does come to life once they hit Los Angeles. Certainly it does follow the same pattern as the earlier material with backstage and onstage footage, Perfume interacting with fans and acting like complete tourists at every city they visit. However the last three shows up the emotional content with some very genuine affectionate and emotional interviews with local fans and A-chan getting extremely nervy before her first US show. It all becomes a bit too much when a LED display malfunctions temporarily and Mikiko tearfully expresses her frustration post performance which makes A-chan and Nocchi’s eyes well up. While Perfume’s journey and performances to the US are a key part of the film, the fans are also an equally important part. The interaction between the three girls and their fans, be it on the street, in concert or at fan club “meet and greets” before shows seem genuinely honest and heartfelt. That and the vox pops with fans can be really beautiful and touching at times. It’s also amazing to note the diversity of the fanbase with wide range of ages a fair number of women in the audience and perhaps unsurprisingly a sizable number of gay men. There’s also a bit of humour as the trio and Mikiko are in hysterics as they do a post mortem on their London show where in one song Nocchi forgets her choreography and manages to put the other’s performances out of whack culminating in Nocchi freezing on stage momentarily. The climax of the film is New York where the trio are stunned by Times Square and perform an emotionally charged final show. Apart from not mentioning their rise to fame in the documentary, there are a couple problems I have with the film. The interviews with the members seem really divorced from the rest of the content. It seems they were done sometime after the tour. I would have preferred those interviews to be done on the tour than after or perhaps over archival footage. There is also some narration which I felt wasn’t really needed, but luckily it is used sparingly. Let’s face it though; this film is for fans, not for the general public. However I still believe that it would have even found a wider audience had even more emotional punch if their full backstory was told. I also thought that the film makers were being a bit coy or modest about what Perfume had achieved. Not many Japanese artists have done what they have. For fans of the group, the film won’t probably tell them anything new about Perfume. As expected A-chan (the unofficial leader of the group) is the most dominant member but also easily the most cheerful and emotional. However the other two always manage to speak their mind. Certainly their onstage personas seem to match their offstage ones. While this may stink of them putting on a performance for the documentary makers, you have to remember that the three of them have been together in the group since they were 9 years old. In one of the interviews A-chan states that the only thing she knows is Perfume and could never see them breaking up. I sort of felt a pang of sadness when I heard that. This set is the only version available in English. I know their management company, Amuse, held one off screenings with English subtitles in the US and UK, however only UK indie record company Wrasse Records has released a physical copy of the film. No one in the US seems to be interested in releasing the film, not even Perfume’s parent US label, Universal. However I doubt a major label like Universal would have taken the care to issue a two blu-ray, one CD set like this. The set comes in a really nice tri-fold digipak with the film disc, a bonus disc with additional behind the scenes footage from Perfume’s SXSW performance, additional interviews with Perfume and the theatrical trailer. The CD is a four track soundtrack with new pieces performed and written by Yasutaka Nakata. The set mimics the special edition released in Japan sans the movie commentary track by Perfume’s staff. This is a film that is difficult to recommend to people who aren’t fans. I find it really baffling that they didn’t tell Perfume’s amazing backstory, however I guess they assumed Japanese fans would be overly familiar with it. I think it could have done with some tighter editing and less repetition regarding Perfume’s pre-show rituals (showing it once is enough). While a film that was shot on a smallish budget, I do think some of the filming could have been better, especially the stuff shot in low light where the limitations of the cameras are rather apparent. The SXSW performance makes for a great opening, but literally has nothing to do with the tour. But the film really kicks into high gear at that start of the American tour. It’s a fun emotional journey and really not hard to feel Perfume’s joy at what they’ve achieved. The lack of proper distribution and the content probably isn’t going to win them any new fans in the west, but I doubt that was the intention. Regardless it's a fairly well made film that fans will probably adore. 7 out of 10. Remaining Backlog: Four movies, one OVA, eight TV series. In addition I am also waiting for second parts of for three TV series and one OVA to be released before viewing them.